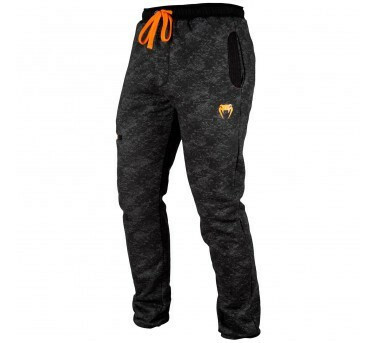 Venum Tramo Jogging pants combines comfort and style for you to brave the cold this winter! Its brushed interior is designed to isolate and retain body heat to keep you warm during training outdoors or in your daily life. Tramo Joggers has an adjustment system around the waist that delivers a perfect fit. It has two side pockets and two zippered pockets for storing and transporting small items. Finally, the Tramo design coupled and orange buttons provide it with a sportswear look. Product Features :51% Cotton - 49% Polyester. Completely brushed interior: for maximum warmth, ultra soft and fluffy feeling. Elasticated waistband and drawstring: good support. Discreet elastic in the legs: for a custom fit. 2 deep side pockets. 2 zipped pockets secure storage of small items. Several sizes available. Venum logo.